“I’d like to exit this place next February,” I said to Ed, as I flipped the kitchen faucet on and no water flowed. “It will thaw in a couple of hours.” Wallace Stevens, he reminded me, said that you must have “a mind of winter.” Then he went on, extolling the joys of dinners by the fire, starting new writing projects, having friends over for hearty suppers, stamping around the bare garden when you see its outlines clearly and can plan for summer, reading that stack of books, watching two movies a night, and on and on. I had to reconsider. 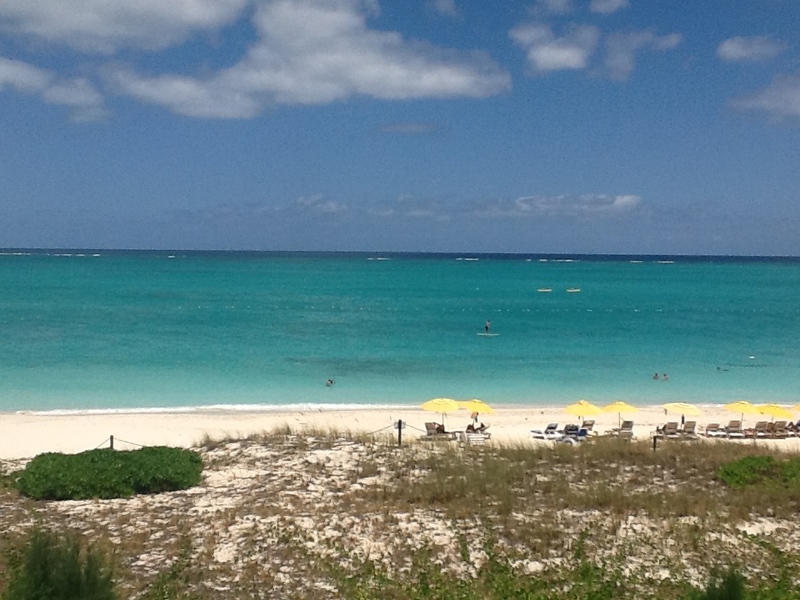 What’s a week in Turks and Caicos compared to all that? At least we are warm at last. We lived here while the house got a new insulated metal roof, the attic and basement were insulated with state-of-the-art materials, while the many layers of paint were sanded off by many men in hazmat, while crawl space was excavated–seemingly by the tablespoon–and the asbestos and pipes and wires, generations of wires, were stripped from the basement, and geothermal heat was installed in the house. This required five small but 300′ deep wells to be dug across the front yard, which destroyed the garden and irrigation. We had only space heaters for two months. It wasn’t so bad. Space heaters have improved but with the electric bill, we could have bought several round-trip tickets to Italy. Still, a miracle to be warm in a house this old, here at the end of February! Time to do all those things Ed rhapsodized about. Here’s one thing I like serving. 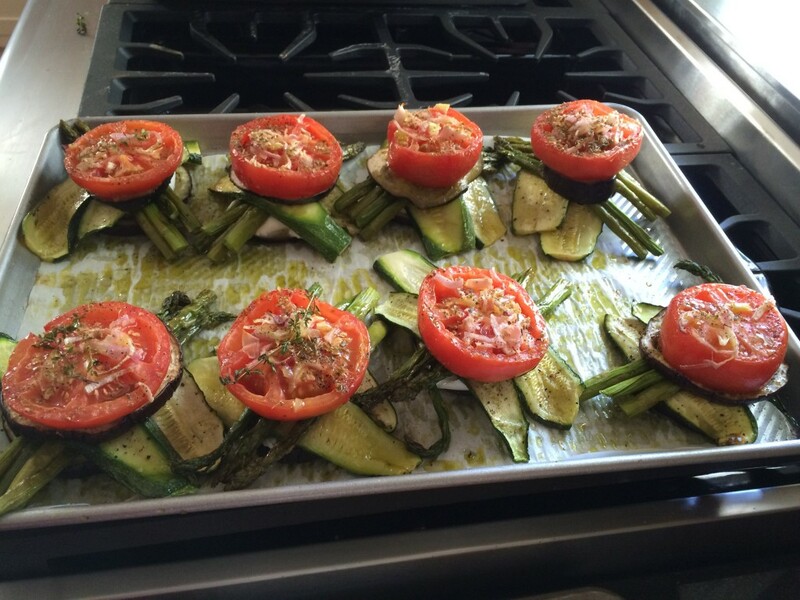 I roasted vegetables separately, as always, but instead of simply serving them on a plate, I made stacks: eggplant slice, zucchini, asparagus, another eggplant, a slice of mozzarella, and a thick tomato slice roasted with chopped shallots and thyme on top. Around this I served big wild-caught shrimp that I flash-sautéed in roasted garlic and olive oil then drizzled with lemon juice. As you see on the pan, I use olive oil liberally. This is a very tasty and easy first course for a feast or a nice Sunday supper. 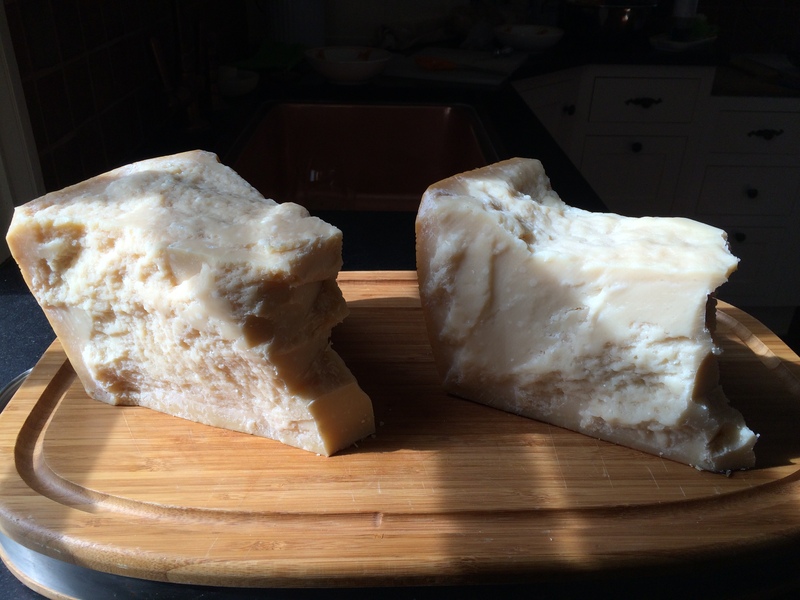 A grand treat–two hunks of parmigiano Ed brought home in his suitcase. Yes, it’s okay to bring in, as long as it’s shrink wrapped. Ask, in Italy, for sotto vuoto. On the left, parmigiano aged 45 months, on the right, aged 24 months. Much of what we get in the US is aged 12 months. Still excellent, but it is revealing to taste the different ages. The 24 month is a bit harder than the usual, grainier, and with a more pronounced flavor. You need less when sprinkling it over pasta. At 45 months–amazing! Very grainy, almost sandy with bursts of flavor from those grains. Dryer, and I want to say sweeter but that’s not exactly right. Deeper in flavor and so intense. My photo is not bad! Looks like a little corner of a Vermeer. That’s the lovely hard light of winter angling into my kitchen. If you go to Italy, it’s worth the extra weight to bring back a huge piece of the almost four year old parmigiano. Ed also brought a substantial wedge of Fior di Monte, a pecorino we love. His suitcase was full of tax receipts for the renovations in Italy, all nicely perfumed with the scents of the cheeses. An unexpected little disaster during the North Carolina renovation was a gas explosion and fire in the kitchen. And you wondered why I’ve neglected my blog…. Anyway, the up result of this is that we have a new stove. A gorgeous new stove. (Was it worth it? Ummmm?) After hours of research, we selected a six-burner American Range, whose major burners have 25,000 BTUs. Not that I even have a wok. The oven is my dream oven. 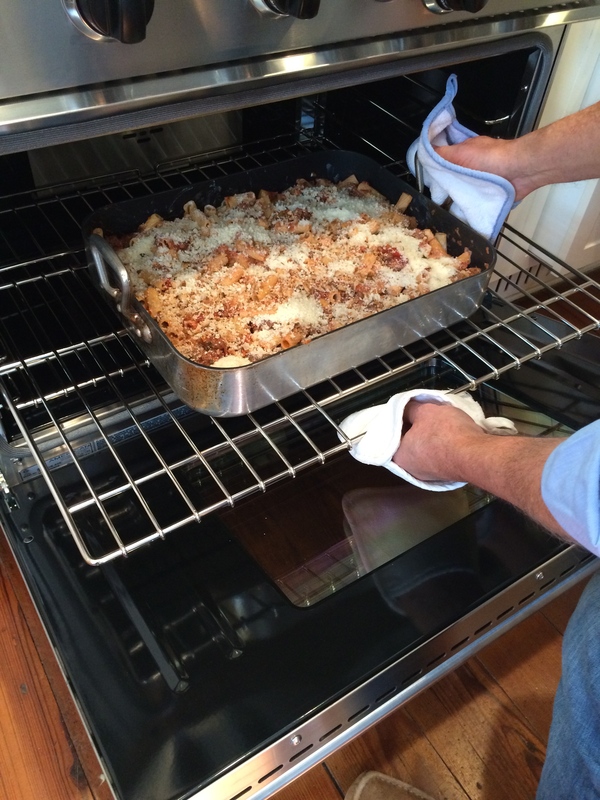 That’s pasta with sausage and four cheeses coming out. This is an all-time favorite recipe–essence of a cosy winter night with good friends. (Recipe in The Tuscan Sun Cookbook.) What’s even greater are the leftovers. The Trace by Forrest Gander. The place itself is the main character in this novel. The place is the Mexican desert and a harsh and scary place it is. The prose here is lapidary and visual. Transatlantic by Colum McCann. Uncanny the way he grasps the immediacy of a character. Here, he strangely weaves stories of eminent men with those of decidedly peripheral and unrealized women. Deftly done but somehow there seems to be a missing core to the book. The Stories of Jane Gardam. Well, I’m a fan. She’s telling the story but telling it slant. A refreshing, off-beat style. I like where she goes for her stories and her sometimes shocking humor, also from unexpected places. Wry and smart writing. Good Behavior, Loving and Giving, Time after Time by Molly Keane. I discovered Molly Keane when I read an interview with Hilary Mantel where she said Good Behavior was her favorite novel. Keane’s territory is the crumbling aristocracy of pre-war Ireland. She’s satiric, and her jabbing humor is even more wicked than Gardam’s, but the characters are vivid and memorable. I ordered all her books from England. I’m finding that I need to read other things in between–a steady stream is overwhelming. So We Read On: How The Great Gatsby Came To Be And Why It Endures by Maureen Corrigan. The subtitle says it all. As a big Gatsby reader over the years, I loved her insights, minute attention, and her passion for this book. 10:04 by Ben Lerner. The writer is hell-bent on pushing the borders of what a novel is. This reads like memoir then parlays the same material into a fiction, but perhaps it’s all fiction. Lerner’s love of language is the pleasure here. The dramatic narrative “hooks” set up at the opening never really resolve, but the imaginative arc of the novel is exciting. As always, I’d love to hear from you about books you’ve liked this winter. Now I’m about to travel to Italy and I’m loading several books onto my iPad for the long flights. When I return, the daffodils and tulips all will be in bloom in North Carolina. Winter will be over. Despite all the cosy fun and the one beautiful day of snow, I never hate to see winter end. And, in spite of Ed’s praise of winter pleasures, I can’t help but think back to last year’s escape. An aqua sea, two yellow umbrellas, powdered sugar sand. I’ll take it! From Italy, I’ll post the photos of the almost-finished restoration of Bramasole. Two projects at once has been madness–but we’ve preserved both wonderful houses for their next hundred or so years. A good feeling. 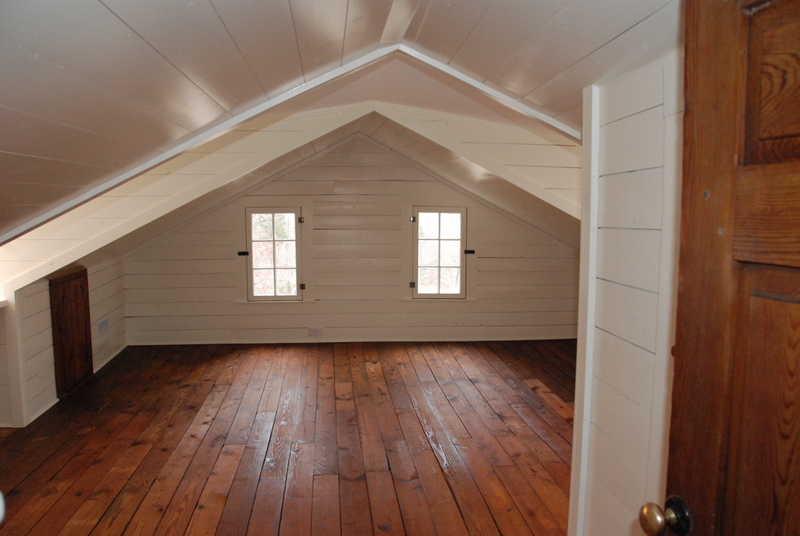 Here’s the renovated attic at Chatwood. It used to have an old chimney from a defunct boiler rising through it, and it was a dark, cut up space. 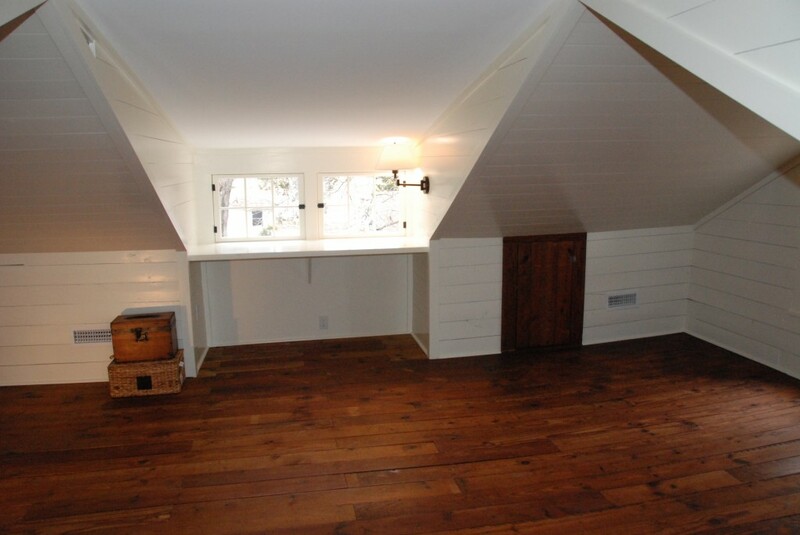 We added the dormer in the first photo to match the one on the right side of the room. We left the floor as it was, just repaired the hole where the chimney was, then finished it with tung oil. What would you do with this space? It has views of the garden on three sides. Isn’t it too pristine for old boxes and suitcases? The rewards of renovation are solid and lasting–a thought to hold onto when your house is draped in hazmat sheeting and fifteen workers are plying their trades and the power is off and the house is shaking. I am totally excited to finish this work and to get back to writing. More from Italy. Keep in touch!